The articles show specific challenges and their solutions as well as technological concepts of automotive diagnostics. The Opel Insignia has considerably more ECUs than did the previous model, and testing effort is clearly higher by comparison. Wide-ranging automation of testing and validation of diagnostic services hold promise for substantial savings potential. The CANoe.DiVa tool automates validation of diagnostic services. Consistent creation, management, and distribution of diag­nostic data throughout the diagnostic development process. In the development of the new 1190 Adventure, and its up to 9 ECUs, an optimization of the diagnostic development process should be performed. In previous development projects, diagnostics was specified in text form at KTM. Automated further processing of the specification was therefore not possible. Rather, the ECU specification required time-consuming interpretation and conversion into input data for the utilized diagnostic testers both internally at KTM as well as at the ECU suppliers. Thus diagnostic testers in development, production, and service became available only at a late stage. Using automatically generated tests for the validation of diagnostic protocol implementation has been practiced for many years. This process is based on diagnostic description files from the automotive OEM. The ECU´s diagnostic interface can be efficiently tested in a varifiable way, and this leads to an improvement in product quality. In addition, automated validation of diagmostic parameters and error codes is also possible - depending on how complete the diagnostic description is - as shown in a joint project by Claas and Vector. Vector and Daimler have tools developed and customized for the special area of motor vehicle diagnostics. These tools are based on the frontloading approach. Application of these tools is extremely effective in terms of quality and costs. Sweden, -20°C, snowfall. A test driver conducts a test drive on a frozen lake covered with snow. During a braking maneuver in a curve, he notices some unusual vehicle behavior. He suspects that the cause lies in the brake system. Although the test driver is very familiar with the vehicle, a precise analysis by a system developer is necessary. Thanks to current testing tools, the time and effort for diagnostic validation is no longer increasing linearly – fortunately. In particular, it has actually been possible for several years to generate and execute diagnostic protocol tests fully automatically. Despite a further in-crease in the functional scope, the time and effort for creating and executing tests remains fairly constant. With the established standards for unified diagnostic communication (UDS) and diagnostic description formats (ODX), it is possible to achieve a comparatively high degree of test automation, and high diagnostic quality as a result. All new vehicle registrations for heavy-duty vehicles must conform to the requirements of the Euro-VI emissions stan-dard starting in 2014. Vehicle manufacturers are obligated to implement a WWH-OBD capable diagnostic system. Even earlier, guidelines for newly developed vehicles take effect; here the deadline is already on 01-01-2013. Consequently, help in testing the implementation with WWH-OBD capable diagnostic tools is very welcome. The development and introduction of new diagnostic concepts and diagnostic solutions offer significant potential to automotive OEMs and suppliers for realizing efficiency gains and quality improvement. 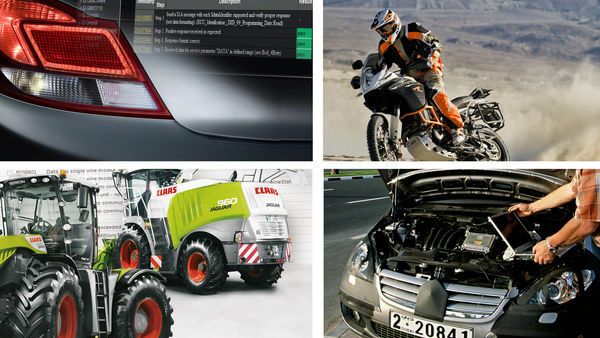 Read more how Daimler or Claas organize their diagnostic development process with the CANdela product family more efficiently. OEMs and Tier 1 suppliers utilize many different processes for the development of vehicle diagnostics. Various exchange formats are used and the implemented tools are usually adapted to each company’s specific process. At the very latest, problems start occurring when diagnostic descriptions have to be exchanged with development partners and used in their tool chains. This is always a time-consuming undertaking – if indeed it is possible at all to exchange data without any loss of information. Here the AUTOSAR Diagnostic Extract Template (DEXT) offers a completely new range of possibilities for diagnostic development. AUTOSAR is the future-oriented reference architecture for ECU software. Clearly specified interfaces, standardized be-havior and XML-based data formats are the key features of this standard. In AUTOSAR, diagnostics is handled in the modules DCM (communications) and DEM (fault memory). Part 1 will address diagnostics in AUTOSAR and related data formats. Description data in ODX format (Open Diagnostic Data Exchange) represents an alternative to configuring the diagnostic software. Part 2 will address the topic of “ODX in the AUTOSAR development process”. Speed up the development process of automotive diagnostics. Vector products that handle ODX diagnostic data. The CANdela approach saves time as well as costs and improves quality. Services with comprehensive know-how in diagnostics.